Sandhill cranes are very large, gray birds standing three and a half to four feet tall with wingspans of six to seven feet. They have long necks and legs. The adults have a featherless, red cap on their heads, while juveniles lack the crown cap. In the spring, their feathers often appear tinged with rusty-red. Sandhill cranes are tall birds with a red cap, white cheek patch and gray feathers that sometimes take on a rusty color. 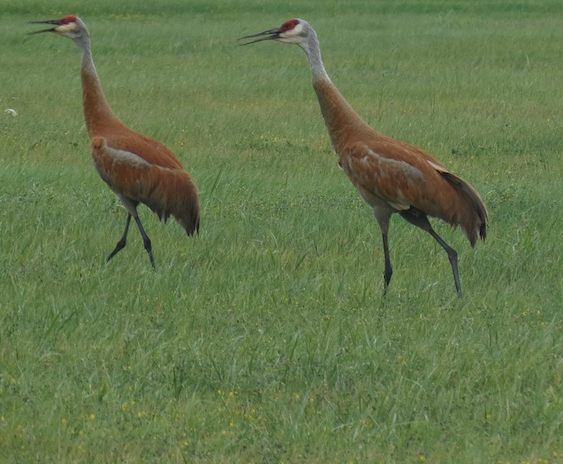 Check out the Cornell Lab of Ornithology All About Birds website about the sandhill crane for audio clips, ID info and life history. Around 20,000 sandhill cranes migrate through Illinois from mid-February to mid-April and again from mid-September to mid-November. Small numbers breed in northern Illinois, particularly in marshy areas in McHenry and Lake counties. In the spring and fall sandhill cranes may be seen flying over Illinois in large groups. They stop in crop fields and marshy areas for rest and feeding. A small number now breed in Illinois, especially in Lake and McHenry counties. They have very loud vocalizations, making rattling “gurrooo-gurroo-gurroo” sounds. 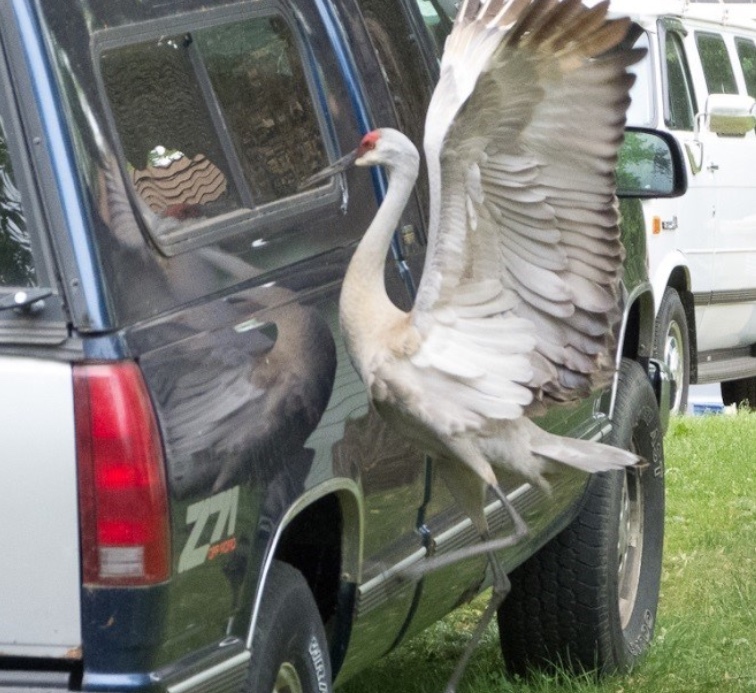 A Sandhill Crane is attacking its reflection in the side of a truck. This behavior can cause damage to the vehicle and injury to the bird. They can become aggressive when defending their eggs and young and vigorously defend their territory. Like some other species of birds, sandhill cranes will “defend” their territory when they see themselves in reflective surfaces such as windows, sliding glass doors and the sides of automobiles. This behavior can damage property and injure the birds. Sandhill cranes can cause injury when defending their eggs and young. Because they are attracted to open areas, they can pose a nuisance near airports. Sandhill cranes use wetlands and agricultural fields during migration. They prefer to breed in marshlands away from the presence of people. Sandhill cranes search the ground for insects, soft-bodied invertebrates, small vertebrates, seeds and tubers. They can do significant damage to newly planted corn fields, plucking the leaves off and eating the seed. Sandhill cranes mate for life. They build nests on the ground out of local vegetation such as grasses, sedges, and cattails. The nests are often a mound of vegetation in shallow water or next to the shoreline. Two olive-splotched eggs are laid, and both parents incubate the eggs and watch over the young. The young are precocial, meaning they are born with their feathers, eyes open and ready to leave the nest within hours of hatching. Typically only one chick survives. If they survive their first year, sandhill cranes can live as long as 20-30 years in the wild. As more sandhill cranes migrate through and breed in Illinois, the chance for human-wildlife conflicts increases. Cranes sometimes cause property damage when they attack reflective surfaces during the breeding season in a misguided attempt to drive away the “intruder” they see in their reflection in windows or the sides of vehicles. They may also dig up newly-installed lawns in search of grubs. Crop damage, particularly to newly planted corn fields, is the main form of damage that cranes cause in Illinois. 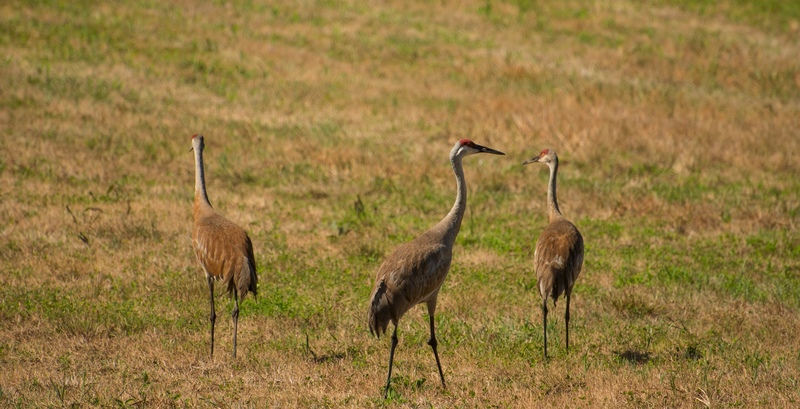 Click HERE for more information from USDA-APHIS-Wildlife Services on how to deal with damage caused by sandhill cranes. During the breeding season, cranes may act aggressively towards reflective surfaces. During this time store vehicles in garages or use a vehicle cover to protect the vehicles from damage. For large windows, close shutters or use opaque tarps to cover the window until the breeding season is finished. Decals or bird tape can also be used but may not be effective if the crane can still see its reflection. 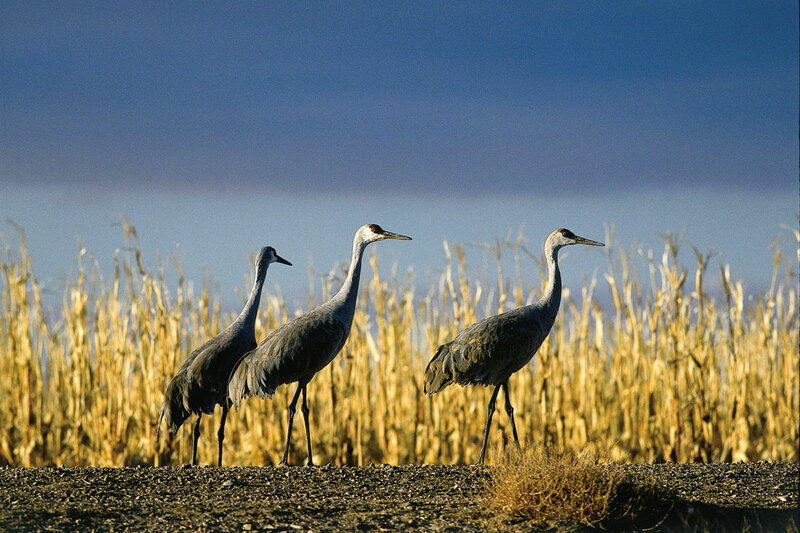 If cranes are damaging crops, habitat modification will not be sufficient to stop the damage. There are currently no registered products that can be used legally to deter cranes from eating planted agricultural seeds in Illinois. The use of frightening devices is the most commonly used management method to prevent cranes from damaging agricultural fields. Propane cannons, flags and streamers tied to fences, and pyrotechnics are used. These methods often just move birds from one field to the next. Damage is dispersed but not eliminated. In Illinois, sandhill cranes are protected by the federal Migratory Bird Treaty Act and by the Illinois Wildlife Code. Sandhill cranes are listed as non-game birds in Illinois and may not be hunted. They may not be captured or killed without a permit from the U.S. Fish and Wildlife Service. If you are experiencing damage caused by sandhill cranes contact USDA-APHIS-Wildlife Services at (217) 241-6700 or toll free at 1-866-4USDAWS. In Illinois, sandhill cranes are protected by the federal Migratory Bird Treaty Act and the Illinois Wildlife Code. They may not be captured, harassed or killed without a permit from the U.S. Fish and Wildlife Service. Sandhill cranes are listed as non-game birds in Illinois and may not be hunted.